I hid the updates using wushowhide, but they installed anyway. If you have ever experienced this, here is an explanation and a way to avoid it in the future. Be sure your Network connections are set to metered connections each time before shutting down the computer. That way, you are on Metered connections when you boot up. + Boot computer with metered connections on. + Hide KB 4023057 (and whatever other updates you do not want). + Open Services – highlight Windows Update Service, set to Manual, Apply, DO NOT start the service. Close Services. + Immediately run wushowhide and verify the update(s) are hidden, then verify they are not available to be hidden. + Go to Settings\Update & Security\Windows Update and click “Check for Updates.”This should give you an error or “Retry.” Close Settings. +Restart the computer. This should allow Windows Update to search for updates without clicking on “Check for Updates” again and refresh the Windows Update queue. + Now you should be able to open Settings\Updates and Security and update without getting the hidden updates. Once you see that only the ones you want are there, turn off Metered connections and allow download. + Reset connections to Metered BEFORE the Restart. If you do not follow the above procedure, the updates you have supposedly hidden may not be cleared from the Settings\Updates and Security\Windows update queue and will thus be downloaded and installed in spite of the fact you THINK you have hidden them. This topic contains 21 replies, has 16 voices, and was last updated by anonymous 3 days, 4 hours ago. Things with Windows are simply nuts when we have to jump through hoops, like the procedure described, to make sure our computers won’t get borked from an update. I treat Win10 from the Group A perspective and I’ve had no issues after installing this update. Obviously no warranty implied, YMMV. Selectively choosing updates in Win10 goes above and beyond and is more akin to Group B (or a new Group, if we’re being honest). I defer feature updates for 120 days and quality updates for 14 days and for 3 versions now (1703, 1709, and now 1803) my Win10 boxes have remained rock solid stable in Group A. A sobering thought to ponder… imagine if any of the other things we turn on and off over the course of the day were as complicated as this. Lightswitches… heating/cooling… car ignitions… appliances… You could spend hours a day ensuring that the thing you thought you turned off was actually off. About the only thing I can think of where this would be a positive would be alarm clocks. The mental exertion and frustration to turn off a Windows-powered alarm clock would probably do a good job to ensure you couldn’t go back to sleep. I’m keeping Windows update completely shut down. I make a disc image. I run Belarc Advisor to show me missing updates. I double-check the advisability of installing them. I use Belarc’s provided links to download the stand-alone updates. I manually install the files. It’s not a background process and it requires my attention. an occasional install aborts because it isn’t applicable to my system. You can use WUShowHide while metered connection is still set to on to hide updates. Updates (and avoidance) shouldn’t be this hard. Really. 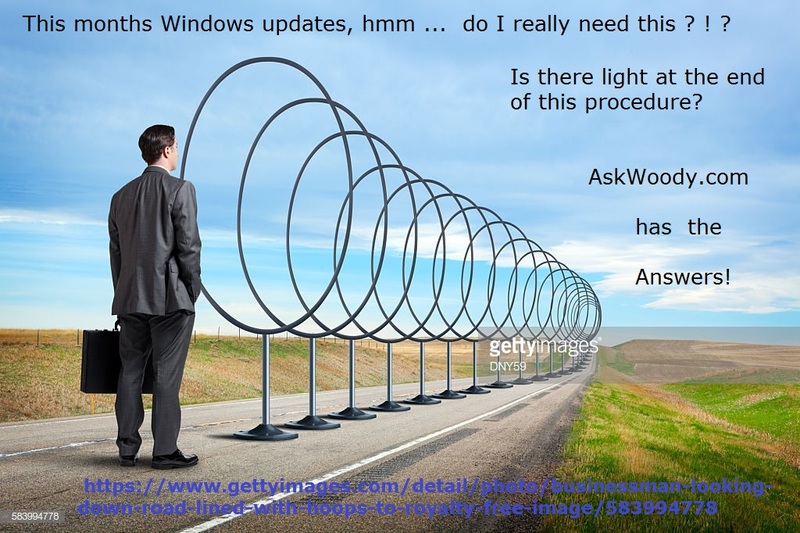 – You’ll be part of the group who can actually use their computers after each patch cycle to go to askwoody.com and read about how the other people using Windows 10 were just incapacitated yet again, and marvel at the hoops they’ll need to be jumping through in the distant hope of getting their computer working properly again! I. Metered Ethernet, always left to metered. I had to do some registry stuff to get the permissions to set this, since it seems Microsoft hid the settings for Metering the Ethernet. Here’s two reg commands that will meter Ethernet and Wifi, respectively. Change the “/d 2” part to “/d 1” without quotes to undo it–but why would you? You might need to get permission in the registry editor (or use regini) first for the ethernet one. I had to. II. Set the update deferral stuff in the registry. Home doesn’t offer the settings (Pro and above do) but it appears to honor them **UNLESS YOU HIT CHECK FOR UPDATES** Here’s six reg commands that do it. The first command sets the branch readiness level to the more deferred one, whatever they’re calling it now. The 2nd and 3rd reg commands defer feature updates by a year. 4th and 5th defer quality (bugfix) updates by two weeks. The 6th one will prevent automatic driver installation if Microsoft still honors it. Who knows anymore? Windows Update is like Calvinball at this point. *Note: You need windows 10 1703 or higher to defer for a year. Versions older can only defer for 180 days. You also need Windows 1607 or later for the 1st one (BranchReadinessLevel) to work. III. I locked the c:\Program Files\rempl folder permissions so System and TrustedInstaller can’t write to it. This prevents the installation of KB4023057. I did this because I am terrible at remembering to run wushowhide, which is a horrible tool by the way. IV. NEVER EVER EVER EVER […] CLICK “CHECK FOR UPDATES.” If you click “Check for Updates,” Microsoft does whatever it wants and ignores all the deferral settings, good practice, common decency, and the fact that “check for” does not mean “install whatever you want.” NEVER CLICK “CHECK FOR UPDATES.” EVER. V. There may have been more settings I changed. These are just the ones I documented. I hope they’re sufficient. I’m pretty sure I disabled a bunch of tasks in Task Scheduler. I can’t remember what they are though and can’t check because I have since reinstalled Windows 8.1. I can’t believe how much less aggravating 8.1 is after fighting 10 for so long. The only thing I miss from 10 is being able to mousewheel-scroll background windows. Turns out I used that all the time. Ever since the October update got pulled my system has stopped re-enabling Windows Update on me. Now that it no longer prompts me to try and do an update daily, requiring me to crash wupdate again to keep a working computer, I haven’t bothered shutting it down. It’s like being in the eye of a storm. No joy for Windows 10 – 1709 Home. Last time it worked after doing a PC Reset. The September 9 posting worked well on Windows 10 – 1709 Pro if you Paused off before the first WUShowHide. May the Forces of good computing be with you! Microsoft really makes it as difficult as possible to fight Windows Update on Windows 10, eh? Even if the updates work fine, that is not the point (and we all know how “good” the quality of recent Microsoft updates are, 1809 initial release comes to mind). The point is to be able to avoid updates when necessary, and Microsoft does everything in their power to prevent normal (Home) users from doing that in Windows 10. From my tests in virtual machines (using Pro / Pro Workstation / Enterprise / Education) and my only machine running Windows 10 LTSB (as a testing machine), what I will do if I ever run Windows 10 (LTSC for me) in the future, is to disable Windows Update using Group Policy and manually download and install any update I may want (using WuShowHide to check first), at a time I choose. Home is not a version I will ever touch. Been doing this for a couple of years now. wushowhide has never worked for me. Likely disabled what lets it do its stuff. What a total PIA. This is the reason I avoid Windows 10 like the plague. Unfortunately, my work system is starting to get a bit long in the tooth, and I might have to bite the bullet soon. Something like pausing updates just shouldn’t be this hard. @pkcano, Quick question. I was messing with my windows 10 update service and never noticed what the default startup should be. It’s set at automatic (trigger) now, but I’m reading online where the default should be manual. did I mess it up, and what should I have it set on. I am currently using WUB and when I use it to unblock the service, it sets it to automatic trigger. Should I enable the service with WUB and then set to manual before using WUB to disable it or is it okay the way it is? I believe the default is Manual (Trigger Start), but I know nothing about what WUB does. Thank you..Windows Update Blocker (WUB) disables the windows update service and then through the registry it assigns it a read only attribute so that windows cannot turn it back on. I really hope people start pushing back on Microsoft, because they’re going way too far with this “shove it down their throats” mentality.